Deborah Watkins Bruner consistently ranks high in NIH research funding. Influential cancer researcher Deborah Watkins Bruner, PhD, RN, FAAN, is the top-ranked nurse researcher in terms of total grant support from the National Institutes of Health (NIH). Bruner was awarded $2.8 million in NIH research grants in 2013—the highest amount of support given to any nurse researcher in the world. Bruner consistently ranks high in NIH research funding. She is ranked among the top two percent of NIH investigators from all disciplines for funding. In 2012, she was once again the top-ranked nurse researcher in the world with more than $4.4 million in NIH funding. This national ranking is based on data provided by the Blue Ridge Institute for Medical Research about principal investigator recipients of NIH funding. 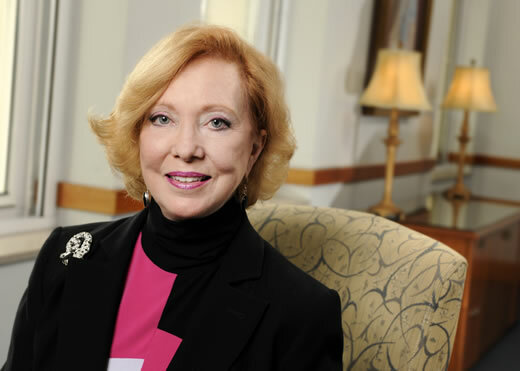 "I am thrilled that Emory is home to the nation’s top nurse researcher in NIH funding," says Linda McCauley, PhD, dean of Emory's School of Nursing. "Dr. Bruner has been a pioneer for conducting cutting-edge cancer research. She is at the forefront of translating clinical advancements into effective treatments for people living with cancer." Dr. Bruner is the Woodruff Professor of Nursing at the Nell Hodgson Woodruff School of Nursing and is the associate director of cancer outcomes at Winship Cancer Institute. She is best known for her pioneering leadership within the National Cancer Institute (NCI) supported Radiation Therapy Oncology Group (RTOG). She is the first and only nurse to lead one of NCI's national clinical community oncology programs (CCOP) research bases and is RTOG’s Vice Chair for Outcomes. Bruner is a member of the NCI Clinical Trials Advisory Committee (CTAC) which helps set the national cancer clinical trials research agenda and co-chairs NCI’s Symptoms Management Steering Committee. "The highly collaborative and multidisciplinary nature of her research at the School of Nursing, the Winship Cancer Institute, and the National Cancer Institute will help Dr. Bruner continue to be a leader in nursing research for lifesaving cancer interventions," says McCauley. Bruner has devoted her research to improving outcomes for cancer patients. Her areas of focus are quality of life and symptom management across cancer sites, as well as decision-making preferences and utilities for cancer therapies. She also is internationally recognized for her research in sexuality after cancer therapy.